Because the thick skin of a pomegranate bursts open, it became a symbol of the resurrection and power of our Lord, who burst forth alive from the tomb. The many seeds bound together in a single skin, represent the unity and oneness in Christ of the many believers. The grapevine border represents Christ who tells us, "I am the true vine, and My Father is the vinedresser...I am the vine, you are the branches." The quatrefoil is a suggestive cross form. In historic Christianity, the four lobes of the quatrefoil represent the four gospel evangelists and the four compass directions, serving as a symbol of the spread of the gospel to the ends of the earth. Four equal foils represent equal proportion, balance, harmony, and wholeness. It doesn't protrude or intrude. It fills and includes. Having no sharp external edges, it can remind us that somehow, our faith walk and that of others must co-exist compatibly, to proclaim the truths of our own tradition without hard edges or harsh boundaries. These crosses are derivatives of the pectoral cross I made for the consecration of The Rt. Rev. C. Andrew Doyle. Bishop Doyle was consecrated on November 22, 2008, to serve as a bishop for the Episcopal Diocese of Texas. He will serve as Bishop Coadjutor until June 2008 when he will become Bishop Diocesan. 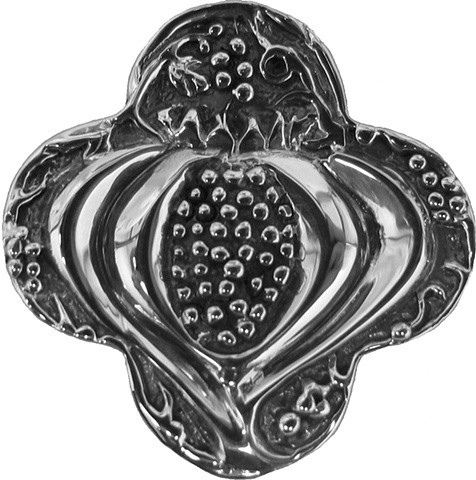 These botanical resurrection symbols are featured on the trefoil ends of his budded cross. With Bishops Doyles blessings I made each into a stand-alone quatrefoil cross from a mold of his gold pectoral cross. I will donate a percentage of these cross sales to be used in Bishops Doyles ministry. The pectoral cross project is documented in the special projects section here.